Mindfulness is a faculty that remains dormant if neglected. If cultivated, it leads to a limitless development of our human potential. ‘Midweek Mindfulness Meditation’ at Barnabas is for those who wish to deepen their mindfulness practice. 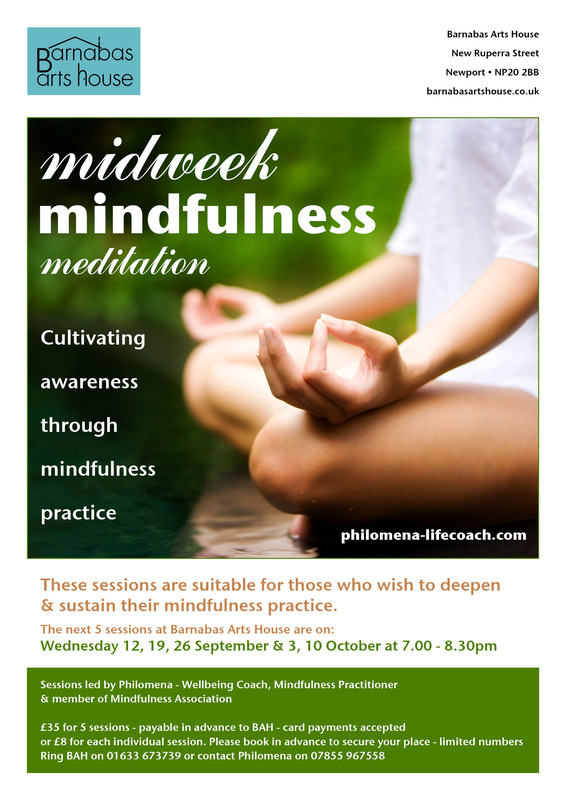 These sessions will be guided by Philomena, our resident wellbeing coach & mindfulness practitioner. Spaces limited, so please book in advance – £35 for 5 sessions* or £8 for each individual session. Ring Philomena on 07855 967558 or BAH on 01633 673739 to book. Mindfulness means paying attention in a particular way, on purpose, in the present moment, and nonjudgmentally.